The staff was fun and entertaining. The staff was fun and entertaining. The rum punch was abundant. We stopped to snorkel and another stop was at the beach. I wish the excursion could&apos;ve lasted a little longer, but it was still fun. This was our 3rd or 4th trip on the Golden Eagle. This trip to Saint Martin we opted to give the kids their first ocean-based snorkeling experience. Better than St Thomas. Guide was excellent. cannot blame the tour for murky water that day - so they dropped food in water, and the fish surrounded us accordingly. most beautiful and built up island as well. 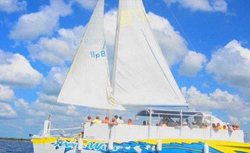 Wonderful catamaran experience. Snorkeling was great this trip. The beach was nice, private area. Excellent experience. Friendly staff on the boat. We did the Maribella Catamaran tour.